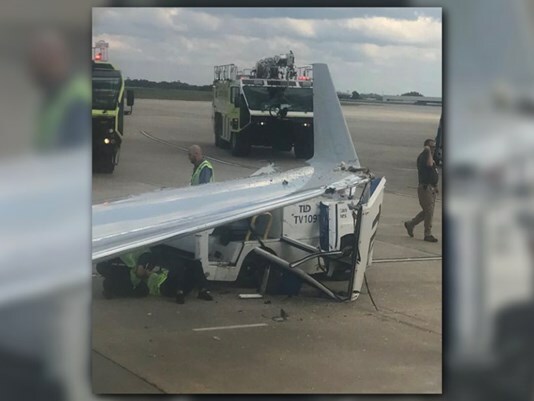 On September 13, 2017, at 3:45 pm eastern daylight time, PSA Airlines flight 5233, a Bombardier CRJ-200, N261PS, collided with a TLD Jet-16 baggage tug operated by Piedmont Airlines while taxiing at Charlotte-Douglas International Airport (KCLT), Charlotte, North Carolina. The airplane received substantial damage to the left wing and the tug canopy section was damaged. The tug driver was seriously injured and there were no injuries to the 53 passengers and crew onboard the CRJ-200. Weather was daytime visual meteorological conditions. the tug operator's initiation of a right turn onto the perpendicular terminal road in proximity to the airplane.